This year the first day of 2017 was also the last day of Kwanzaa, Imani, the affirmation of faith. Over 200 people gathered at the Charles H. Wright Museum of African American History to share in celebration of the day. Young people with the Detroit Independent Freedom School Movement joined with parents, teachers, friends, artists, and activists to emphasize our faith in one another and our capacity to create a better city and a better world.It was a good way to begin this new year. The Al Nur Drum and Dance Company set the energy for the event as people gathered to light the Kwanzaa candles. Each candle calls forth a value that will be important for us to remember as we face the choices of the coming days. Unity, Self Determination, Collective Work & Responsibility, Cooperative Economics, Purpose, Creativity, and Faith are critical guideposts to judge our actions. People were reminded of the powerful history of the Freedom Schools that emerged in the 1960’s. These schools were about more than classrooms. As Jon Hale wrote in the Atlantic, freedom schools were part of a larger movement for Black Liberation and were designed to teach “the art of resistance and the strategies of protest.” In the process they raised questions about the very nature of our democracy. This is an important history for all of us to remember as we decide how to resist the growing greed, dehumanization, and destruction of the coming federal administration. As we move into 2017, we face another “showdown.” None of us should have any illusions about the level of violence that so quickly surfaces against those who move us toward a more just future. Nor should we lose faith in our capacity to resist, to find ways to work together, to celebrate our creativity, and to forge a place for our children. I am true believer in the power of poetry. After all, I have considered myself a poet since I was 7 years old. I can still recall the butterflies I felt in my stomach when my elementary school teacher had me read, and later perform Langston Hughes’s I Too, Sing America. It was a life changing experience. I grew up with a grandfather as a pastor. When I was a very young child he would have me memorize scripture and recite it at the head of the church. I was proud to learn the lines and all the books of the Bible. There was something fulfilling about it. I can’t recall how solid my interpretation was of what I was memorizing at that age, but I do recall that there was something about my reciting those lines that made the congregation feel good, that made me feel good. There was something that shifted in the atmosphere for them and for me when I would recite to the audience. But, it was experience with getting to know Langston Hughes’s poetry that took my life to another level. I found a spiritual connectedness I had never felt before. The words drew me in, made me think and emote. I knew then that I wanted to be a poet. Poems helped me escape everything around me. I could write a poem that took my sorrows and placed them into testimony. My grandpa started to let me read poems in front of church, instead of scripture. He understood that poems were my scripture. I suffered many things as a child and I often think back about the times I’ve endured the most trauma in my life and the poems that came to rescue me. They have been a beautiful refuge from a sometimes ugly world. As an adult I have struggled with how to keep poetry as a significant part of my life. Art, and especially poetry is often treated as an afterthought of struggle and resistance. The deeper I got into ideological study and thinking, the deeper the questions about my art became. How can I be political, yet visionary as an artist? How can I use poetry as an organizing tool of resistance? How can I bring my seemingly contradictory worlds together? After deep meditation, I created a workshop called Poetry as Visionary Resistance. The workshop helps me to apply political ideology and organizing to my love of poetry. It’s the way I discovered how to merge my worlds. It’s an adaptation I’ve become quite proud of. I was recently forwarded a write-up by Wayne State University student, Julia Grace Hill about one of my workshops and it brought me to tears. The write-up did not focus on the “success” of the workshop, it focused on the author’s love and renewed appreciation for the power of poetry. It was more than I could hope for. Reading Julia’s reflections took me back to the butterflies that inspired me to live my life through poetry. The renewed my desire to continue to create for something larger than myself. What does it mean to resist? What role should vision play in our resistance? What becomes of a visionary, stuck in a deficit mindset? When I started to speak with tears streaming down my face, the sermon took on a life of its own. It can be found here. May we all discover a lifelong love for poetry. May our visionary resistance live on. trapped in a deficit mind? What becomes of their art? What becomes of their shine? til we just frame and bone? with no hope to spare? or dissolve in the air? or get lost in the fray? til they vision a way? whether our lives would be over. while their bodies were enslaved. As I look back at 2016 and enter 2017, I am reminded that we will commemorate many anniversaries this year. The world will commemorate the 100 anniversary of the Russian Revolution of 1917, the 80th anniversary of the Flint Sit-Down Strikes of the UAW, the 50th anniversary of the 1967 Detroit Rebellion and the 50th anniversary of the MLK speech: Beyond Vietnam: Time to Break the Silence. I am reminded of historical turning points and moments of choice when ideas and actions matter. We live in such a moment. A Moment when there is no separation between the Urgency of NOW and the long haul, where our choice is Community or Chaos. 2016 was a very personally significant year because it was the first year in more than 40 that my political work in Detroit did not include a living relationship with either James or Grace Lee Boggs. James died in 1993 and Grace transitioned in 2015. 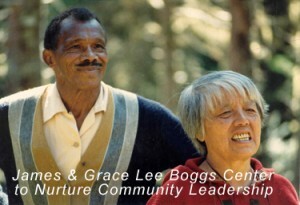 The James and Grace Lee Boggs Center to Nurture Community Leadership continues the intellectual and on the ground work in Detroit and across our country and globe. I am very fortunate to be part of this legacy and ongoing work. In 2016, My wife, Janice, published a new book, What Matters! Reflections on Disability, Community and Love which chronicles the journey of our son, Micah, who has an intellectual disability. For the first time in our lives we have no living parents sharing their memories or stories with us at the holidays. My dad, Myron, died in 1970, my mom, Pearl in 2013, and Janice’s mom, Delores passed in 2014 and her dad, Albert in 2015. Both Emma and Micah continue to live in Boston & Syracuse respectively where they are both teachers with a strong commitment to “making the world” a little better. History, time and ideas remind me that Donald Trump and all his attempts to save the dying order of capitalism/racism is not permanent. Trump also supports a continued materialist collision course with nature (planetary suicide or natural genocide). Out of the pain and the whip of the counter-revolution will emerge a new historical period, for better or worse. We are in a battle to create the future. Yes, it will be dangerous, filled with fear, pain and hate and also awaken more people to resist and to look deeply at the need for new solutions and new thinking. Some will look to old solutions and old thinking and others will ask deeper questions, become more radical and look at ourselves and our comfort zones. Hope is about taking the next step. We live in 21-century movement times. 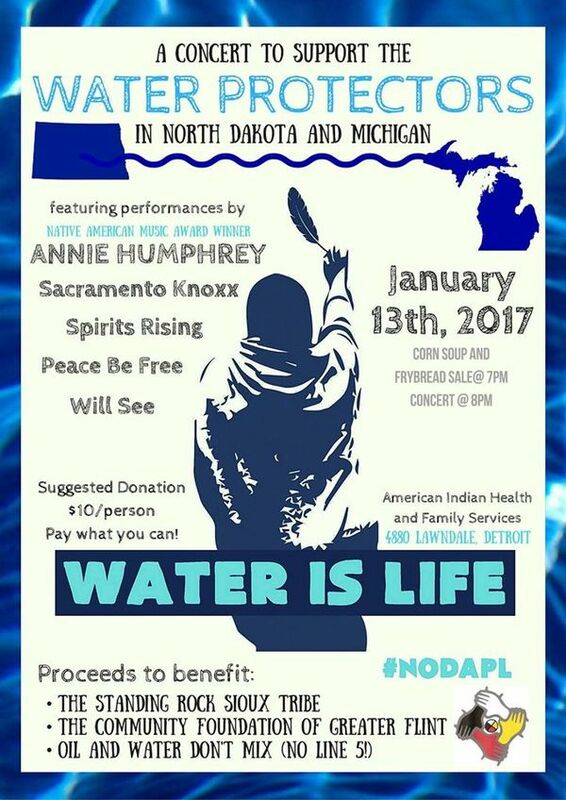 From Arab Spring to Occupy to Black Lives Matter and from defining ourselves as protectors and stewards of the earth to the leadership of our ancestors and the historic role of women at Standing Rock. As we enter into new territory taking new steps, create new practices, reflecting on theory and practice, we set free our imaginations. Create resistance and sanctuary neighborhoods, cities, counties, schools, union halls, faith based centers, and workplaces. Create sustaining circles of support and commit to creating the Beloved Community. These are the times to grow our souls! Our human spirit is searching. Host community readings of the MLK speech: Beyond Vietnam: Time to Break the Silence calling for a radical revolution in Values. Listen to Krista Tippett interview with Vincent Harding and Rube Sales. Check out emerging Fab City Movement (From Barcelona to Detroit). The JOB economy is over. It’s our time to re-imagine work. Create and support local sustainable community production and self-governing democracy zones where we live. Begin to write local constitutions based upon new values and principles to build a new nation from the ground up. Create discussions, listen and engage with folks in the suburbs who too often have ignored or minimized the truth of our nation’s history and thus, quietly or actively, supported the exclusion of those who never gained from the American Dream. Create Brave Spaces. There cannot be reconciliation or a coming together of our nation until there is truth telling. Creating brave conversations about racism, misogyny, xenophobia and ableism are essential for personal and collective transformation. Read Karl Polanyi’s Great Transformation, Grace Boggs’ the Next American Revolution and Immanuel Wallerstein, so we can really deepen our understanding of today by understanding this historic-epoch transition moment in which we live. Publically express what you believe. When our children and grandchildren look back in 50 years or 100 years, what will they see? 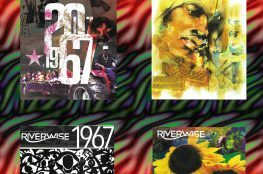 What can 2067 or 2117 look like? Our choices, our actions, our ideas do matter. Will they matter enough? Our future is up to us! Imagination and no regrets in 2017! 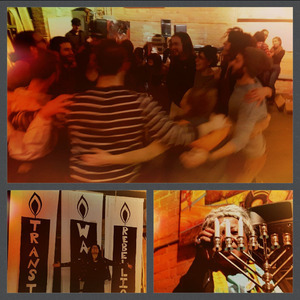 Some of our most trusted partners lit the menorah. What an incredible privilege to offer the honor to friends whose leadership we have been blessed to follow this year. We were joined by friends from The Motor City Freedom Riders, The Ecology Center, and the People’s Water Board. Hanukkah means “dedication” – it gives us an opportunity each year to rededicate ourselves to struggles for justice. Tonight, new and old leaders committed ourselves to stretching ourselves in the coming year — to showing up for learning, for action, for play, and for the nitty-gritty. Watching a slideshow of our short history I felt amazed by how much we have been able to accomplish so far. The plans our leaders are developing for this coming year are ambitious. We ask for your voices, hearts, hands, and feet — your money and your time. It is only with all of those things can Jews in Metro Detroit join the fight for racial and economic justice. Kol echad who or katan, v’kulanu or eitan — Each of us is a small light, all of us are a great light. The Boggs Book Shop is open and waiting for you! 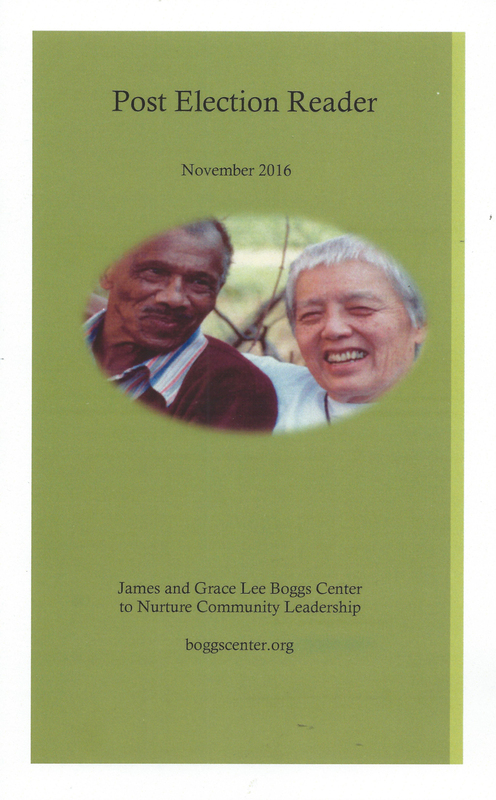 2016 © James and Grace Lee Boggs Center to Nurture Community Leadership. Crafted with love by SiteOrigin.